I present to you what is quite possibly the quickest terrain generation system there is that doesn't simply involve grabbing whatever features you have in reach and plonking them on the table. The goal of this system is to produce varied battlefields using a method that is Better Than Random(patent pending, honest!) - the number of possible combinations is finite, but high. To achieve this, the system used two decks of cards, one card gives you a list of what terrain to use on your table and the other gives you a map showing where the terrain is placed. The two main advantages of this is that the setup is not predictable ("Two hills and two woods, again!") but unlike completely random methods, you know how many of each type of terrain you will need ("SIX rivers!"). Note that the system is generic and intended to be used with pretty much any game system. It does not contain copyrighted material and is not based on any terrain generating method in any rulebook anywhere. Below you will find the standard generator, intended for tables 4 by 6 foot in size, as well as additional cards for tables of different sizes and some themed selection cards that can either complement or replace the standard ones. Hit the 'refresh' button in your browser to generate another sample. Terrain pieces should be more or less 8" by 8" in size, or have an equivalent footprint. Exceptions are obstacles and rivers. Obstacles should form a continuous line (not necessarily straight) no more than 18" long and where the end points are no more than 15" apart. 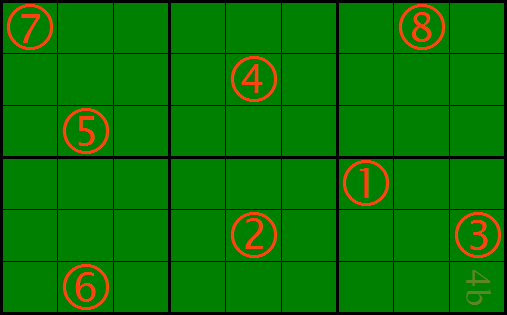 Rivers should be long enough to connect the two closest table edges, passing through the position marked on the placement card. Rivers should come with one crossing point per ~2 feet in length, either a ford or a bridge. Terrain for your fantasy miniature wargame presents several recurring challenges. Not only does it take a fair bit of effort and / or money to get something that both looks good and is practical to use on the tabletop, but it also requires some effort (though probably no money) to place it in such a way that you get a battlefield that is both good looking and challenging for the players. Miniature wargames rarely go into any kind of dept with terrain placement, and commonly just say that terrain should be placed in any mutually agreeable manner. In my experience, this often leads to one of three things, depending on how many of the players view terrain placement as something you do to give yourself an edge in the coming game. If both players are out to get the most out of the terrain, it tends to devolve into a game of checkers � you place a some walls there to take cover behind and I place a sheer cliff in front of it to make it useless. If one player is cutthroat and the other is unsuspecting, you tend to end up with terrain that gives an exaggerated advantage to one player � try to cross a board covered in swamps to get at an artillery train and you will see how much fun this can be. If neither player sets out to gain the most from terrain the result is often fairly balanced, but tends to be rather dull � one hill in each deployment zone and one wood on each flank for the eight time in a row. Over the years, I have experimented with various methods for setting up terrain that would give a fairly balanced table without becoming too dull. For quite a long time I used a random method that worked quite well, but had the disadvantage that it sometimes asked for excessive amounts of one terrain piece I only had one or two examples or. Furthermore, it just took too long with all the rolling on tables, checking for availability and scattering the pieces across the table. I needed something that would let me set up terrain in a minute or so that and which would present a challenge to both players. Eventually I hit upon an idea that was inspired by the scenario cards used in Battleground Fantasy Warfare combined with my continued preference for random terrain. It occured to me that if I randomised the placement and types of terrain in advance, I could write down the placement of the pieces on one card and the types of terrain features to be used. Make a dozen cards of each type, randomly draw one card of each type, combine the two and there you had it. After that it was the reasonably simple process of asking people (I did this on the Warseer forums) what kinds of terrain placement people enjoyed, make a randomisation algorithm that could produce good results, and then do the same to get good selections of terrain features.